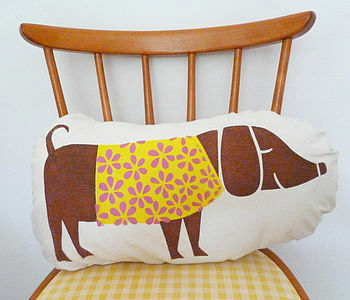 Handprinted Children's Dog Cushion. A funky baby's cushion, handprinted with a sausage dog with a yellow and pink floral coat. All handprinted and handmade by us in the UK. Every one is unique and special. Great for nursery, children's and even grown up's room. Great as a baby cushion, children's room and even adults love them! A fabulous dog birthday present. Personalise option available with your own name running along the bottom underneath the dog print, please see 'sellers complete tange' on the right. 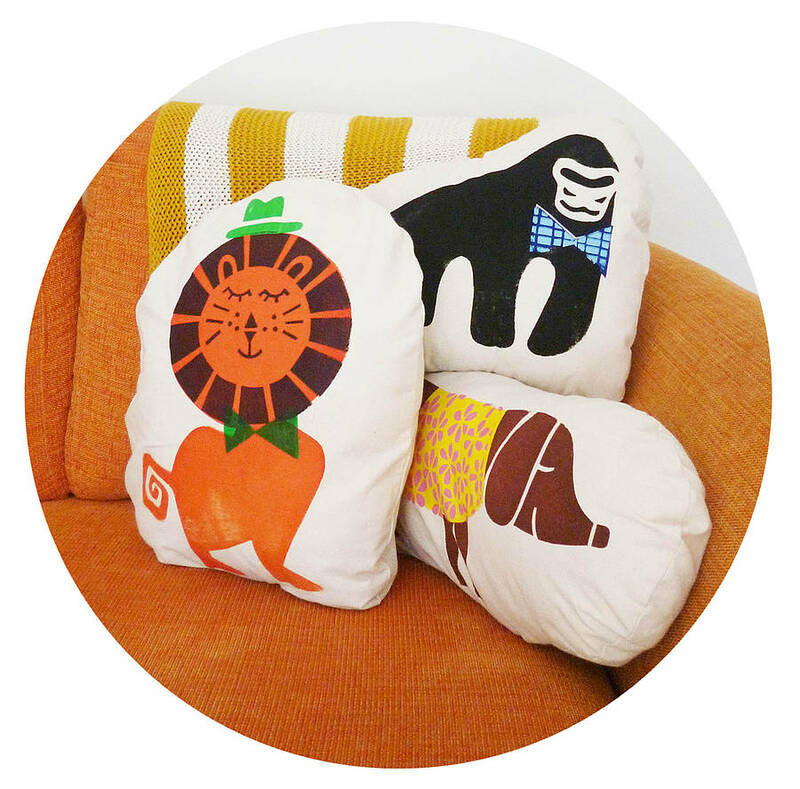 More children's animal cushion designs are avaiable, such as a gorilla and lion in a top hat and bow tie. More designs coming soon, so please keep a look out! Love this design? You will also love the same designs and more in animal printed babygrows, t shirts and sweatshirts. Check out all our favourite designs by clicking 'see seller's complete range' on the right. 100% cotton natural cream cushion, made from the highest quality fabric. Everything screen printed in the UK using water based ink, keep your cushion looking good, wash at 30 degrees. Cushions have a removable washable cushion cover, inside pillow case is 100% polyester fibre which has a high loft and a lovely soft bounce feel in a 100% cotton case. This products complies with the relevent requirements of the furniture and furnishings (Fire & Safety ) Regulation 1988.